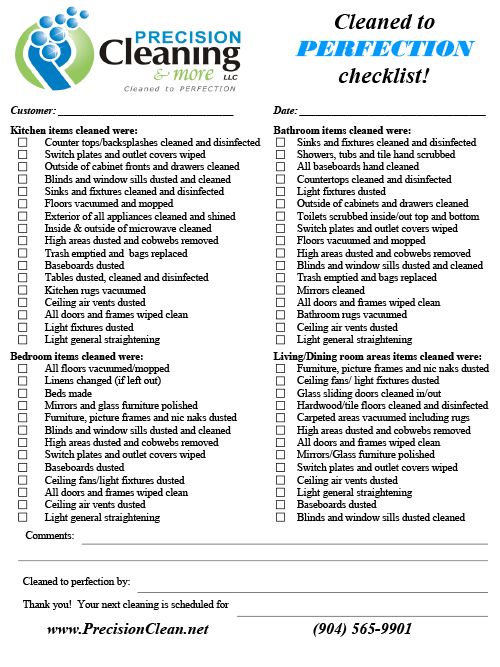 Our new and improved Cleaned to Perfection checklist is the most thorough, meticulous and detailed in the industry. Unlike the others who only perform a surface cleaning we clean and disinfect all areas of your home each and every cleaning. With our through and meticulous cleanings we go above and beyond cleaning all areas and hitting those often missed areas to include ceiling fans, blinds, window sills, detailed hand scrubbing of showers and tubs, exterior of appliances, exterior of all cabinets and drawers and much more! Click here to download our NEW & IMPROVED Cleaned to Perfection checklist!